Sitton’s Comprehensive Energy Strategy™ (CES™) optimizes every aspect of building performance. The CES™ is a beginning to end process including strategy, planning, and execution used to transform our clients’ facilities. Through our CES™ process, your facilities will attain immediate energy savings, the highest return on investments, and overall increases in occupant satisfaction. This unique process involves the application of the following tools to establish a strategic roadmap, plan its implementation, and effectively execute it to deliver the maximum return-on-investment. 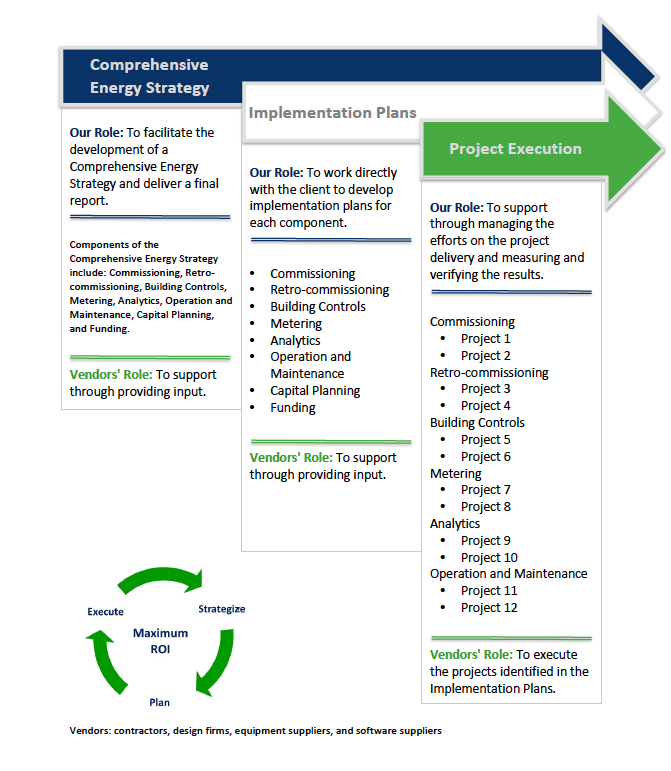 The Strategy Builder™ — a streamlined process of establishing goals and a strategic roadmap to optimize facility performance. The Implementation Planner™ —specific solutions to optimize every aspect of building performance and maximize return-on-investment. The Execution Maximizer™ — the execution, implementation, and continuous support of projects to ensure expected results.